Small elephant cushion to cuddle and care, beautifully embroidered, all different and hand-made by Penduka artists from the slums of Katutura district, Windhoek. Size roughly 13cm x 17cm. Cover 100% cotton. 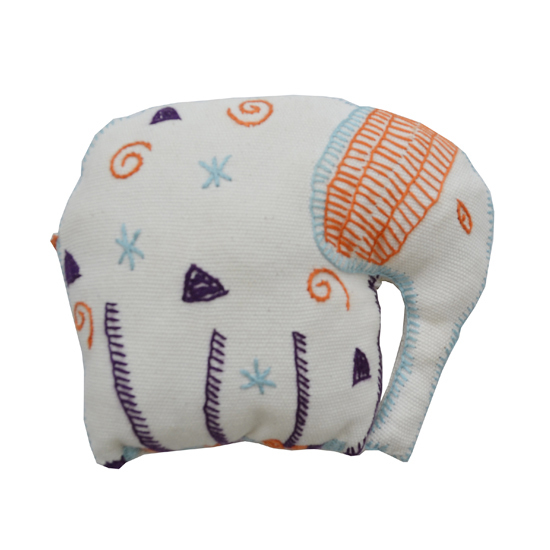 Small stuffed elephant cushion to cuddle and care, beautifully embroidered and hand-made by Penduka artists from the slums of Katutura district, Windhoek. The contrast between their social environment and this very delicate embroidery confirms once again the enormous differences that one encounters in Namibia day in day out. For other specific color/ size variants or personalized motifs please contact us. Available in off-white with orange, mint and purple embroidery. Size roughly 13cm x 17cm. Cover 100% cotton. Washable on gentle cycle.